John Deere selected HCSS as a partner based on compatibility with its WorkSight technologies and ease of use with customers. 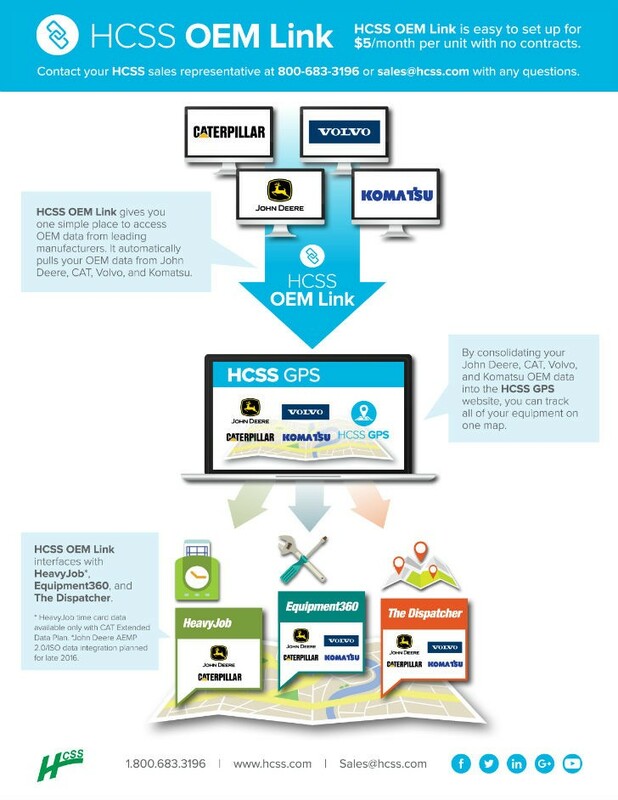 Continually looking for ways to increase productivity on the jobsite, John Deere is partnering with HCSS – one of the construction industry’s leading providers of management solutions – to further enhance the capabilities of John Deere WorkSight and to put the power of JDLink data in the hands of customers. The partnership stems from the Association of Equipment Management Professionals (AEMP) actively working with major machine manufacturers to standardize telematics data available for integration into other applications, commonly known as the Application Programming Interface (API). HCSS provides a comprehensive suite of construction solutions for both operations and equipment management. Utilizing HCSS’s innovative software with OEM telematics data integrated, customers will have direct access to valuable data like meter readings and location. Customers also will have access to information like fault codes, utilization hours, and fuel consumption data for their entire fleet, regardless of the manufacturer. “Integrating JDLink with the HCSS portfolio gives our shared clients an edge by leveraging data to make more informed decisions to drive productivity, which is critical on the jobsite,” said JP Giometti, HCSS director of strategy & RD. John Deere selected HCSS as a partner based on compatibility with its WorkSight technologies and ease of use with customers. HCSS also is an alpha tester of JDLink Machine Data API (AEMP 2.0), which is scheduled to launch later this year.